Olfactory coding is probably not as well understood as the coding in other sensory systems. 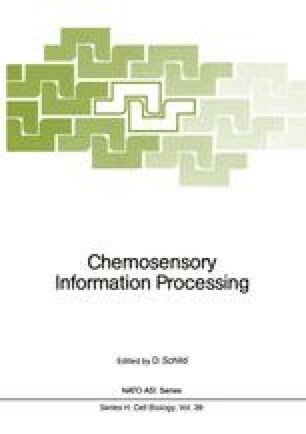 Most of the earlier theories dealing with olfactory coding consider only interactions between odorants and receptor cells (Amoore 1962, Amoore 1977, Davies 1965, Wright 1976, Beets 1957). A unified theory of these interactions may eventually evolve from biochemical and patch clamp studies on the olfactory transduction mechanisms (for ref., see Chapters 1 through 4 and Chap. 6 through 9 of this volume); especially promising is the use of olfactory receptor m-RNA to express membrane receptors and channels in oocytes (Getchell, this volume). However, understanding the transduction processes alone does not resolve the question of how olfactory coding is done, i.e. how receptor activities are processed by the following stages of the olfactory pathway. Consequently there have been only a very few attempts to treat rigorously the transmission of olfactory information along the chain from receptor cells to olfactory bulb and cortex (for ref., see the chapters by Freeman and Kauer).